Papiss Cisse along with Cheick Tiote have already taken a lot of criticism this season for supposedly being bad apples in the Newcastle dressing team but according to manager Steve McClaren nothing could be further from the truth. 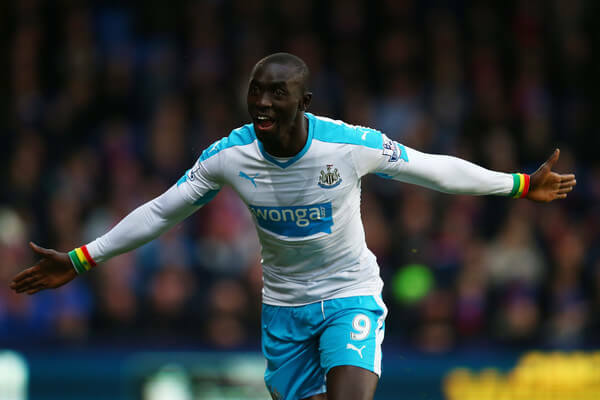 And comments from striker Papiss Cisse suggest he is not a problem at all and simply want to play well and score goals for Newcastle – and it looks like we need his goals this season. Last season Papiss wasn’t 100% fit with that bed knee of his, but that didn’t stop him from scoring 11 Premier League goals in 22 games and this season he has a couple of goals in 10 appearances. We did really well last week to defeat Liverpool 2-0 and it was the highlight of the season so far and was our second win in four games. But in the other games we conceded eight goals and lost 3-0 to Leicester at home and 5-1 at Crystal Palace, so we don’t know which team will turn up this afternoon at White Hart Lane. But we must become more consistent and wins are important if we are to move away from the relegation zone, where we are at the moment in 3rd bottom place. We are hoping for at least a draw today and expect Papiss Cisse to start up front with Siem de Jong in an unchanged side. I do actually think the key to saving this season is to replace both Cisse and Tiote with proper players granted with experience and leadership ability! …we need an experienced core to help the young inexperienced players. I’d be more than happy for Cisse to stay unless they can bring in another striker with PL experience that could grab one goal in three at least, that Beranho sounds good but just a few stumbling blocks in getting him to join. McClaren’s sighs of regret are deafening in that article! What the hell…?? Watching MOTD rerun…what exactly are Everton doing? How did they fail to stuff Norwich outa sight? When you’re down in the dirt you hope teams do what they should against your ‘rivals’ – Norwich should be below us in the bottom 3, at least til this afternoon, on GD,right now. Mind you swings and roundabouts..
Last game of last season we could have been in the Championship if West Ham had bothered to turn up against us and another result went a different way. I’d take a hard working shyte 0-0 draw now if given the choice. I’m going for either a 2-2 draw or we get stuffed 4-0. Jail…no need to let anyone go unless we replace them with experience and ability of course! i <3 mitrovic but we do not play to his strength's when we dont get crosses in the box. goals and assists from wij and siss are all good and well but if we are playing with makeshift wingers who use speed more than crossing ability then the faster cisse is prob the best option for the game. i'd still love to see the 5-3-2 formation tbh though as i still think janmaat and hairdryer are by far our best crossers from the wings. Hi everyone. I think we have to look at each possible match result using the principle that ‘you couldn’t make it up’, that is, what is the most unlikely result. We I reckon that as we haven’t had anyone sent off in a couple of games we might end up with less than the full complement at the end of this game and a battling draw as a result. We might even get a corner again.. Anyone been watching Bournemouth recently? I actually think last week we shat it when Bournemouth beat Chelsea which forced us into a performance so kind of hoping last night will shock us into another ! Always had a soft spot for Cisse. Going into games like today, he is always liable to get one as the level of opposition seems to make little difference to his game. He got a lot of blame for offsides when we were hoofing straight long balls to him under Pards, especially after Cabaye left. Maybe under Macca he will regain his goal touch. To be honest I’ve got no regrets about letting Gosling go, he was one of my least favourite players of recent memory along with Obertorone, Danny Simpson however was a real waste, just the type of player a successful team needs as a back up squad player. Unfortunately we wanted to play players like him and Williamson as ‘purples’ but only call them and pay them as sh!tty browns ! Attack Toon, Attack Attack !! A German centre back (robin knoche) and dm please plus shelvey and Redmond. Too many people don’t care ! In fact if we had have kept those 3 with also keeping Jonas we would have experienced back ups who put the work in which would then have allowed our very talented group of young foreigners to adapt to the league quicker! As always with our club penny pinching takes priority but the extra places would have been covered with prize money for finishing higher up the table ! Ashley and Charnley logic ! !Makes complete sense to them!! Can you imagine if we had ambition, all the people who have stopped going and all the people who have replaced them turning up to watch a team with intent and purpose, we’d have 70K+ week in week out ! Cisse only attribute is positioning in the 6 yard box for scrambles he offers nothing else and I don’t feel we can afford the luxury of carrying a player like this (if only he had not been pardewed and could instinctly strike the ball from anywhere like he used to). Perez and mitro both offer more to our game and should start ahead of him.